Johnny Depp : Fear and Loathing in Las Vegas ! 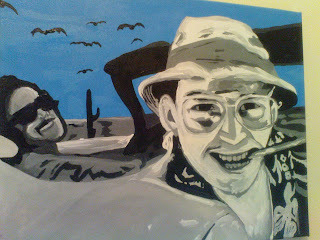 "Fear and Loathing in Las Vegas" is a 1998 comedy film adaptation of Hunter S. Thompson's 1971 novel Fear and Loathing in Las Vegas: A Savage Journey to the Heart of the American Dream. 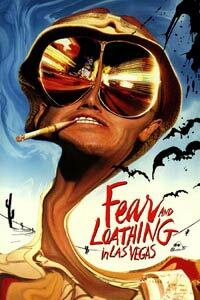 The film, directed by Terry Gilliam, stars Johnny Depp as Raoul Duke and Benicio del Toro as Dr. Gonzo. The film opens with a montage of protests regarding the Civil Rights Movement and Vietnam War, before cutting to Raoul Duke (Depp) and Dr. Gonzo (Del Toro) speeding down the desert of Nevada. Duke, under the influence of mescaline, complains of hallucinating a swarm of giant bats, before going through the pair's inventory of psychoactive drugs. Shortly afterward, the duo stop to pick up a young hitchhiker (Tobey Maguire), and explain what they are doing. Duke has been assigned by an unnamed magazine to travel to Las Vegas and cover the Mint 400 motorcycle race. However, they have also decided to take advantage of this trip by purchasing countless drugs, and rent a brand new Chevy Impala convertible. The young man soon becomes terrified of the drug-filled antics of the duo, and flees on foot. 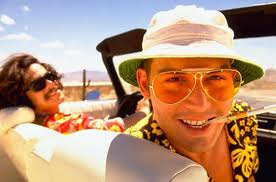 Trying to reach Vegas before the hitchhiker can go to the police, Gonzo gives Duke a tab of "Sunshine Acid", then informs him that there is little chance of making it before the drug kicks in. Leonardo DiCaprio's "The Beach Movie and Soundtrack"